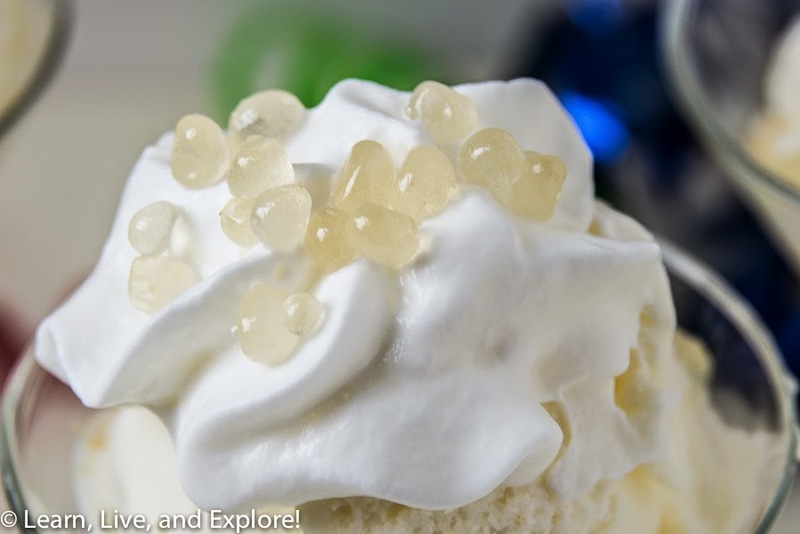 Margarita Ice Cream with Lime-flavored Dessert Caviar ~ Learn, Live, and Explore! Here's a nice, festive treat for Cinco de Mayo this year. 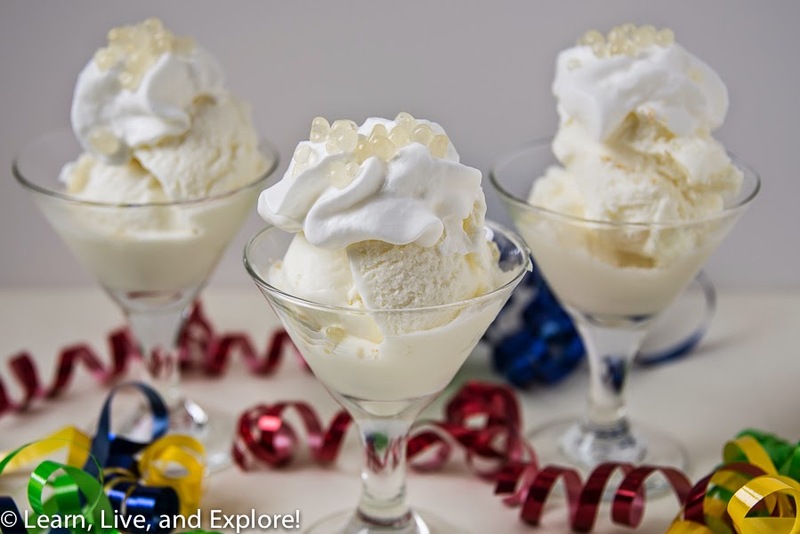 This is a creamy and tart gem from the UK's Nigella Lawson, with a minor modification to make it more like the margarita recipe, borrowed from my Aunt, that I love to make for parties. The best thing about this recipe is that you don't need to churn it or process it in an ice cream maker. Just whip it up and freeze overnight. As a way to step it up a bit, I made a dessert caviar topping that was inspired by one of my favorite blogs: Sprinklebakes. They look hard to make, but if you have the tools and understand the logic of jello, you can do it!! Pour the limeaid, tequila and cointreau (or triple sec) into a bowl and stir in the sugar to dissolve. Spoon this into an airtight container to freeze overnight. 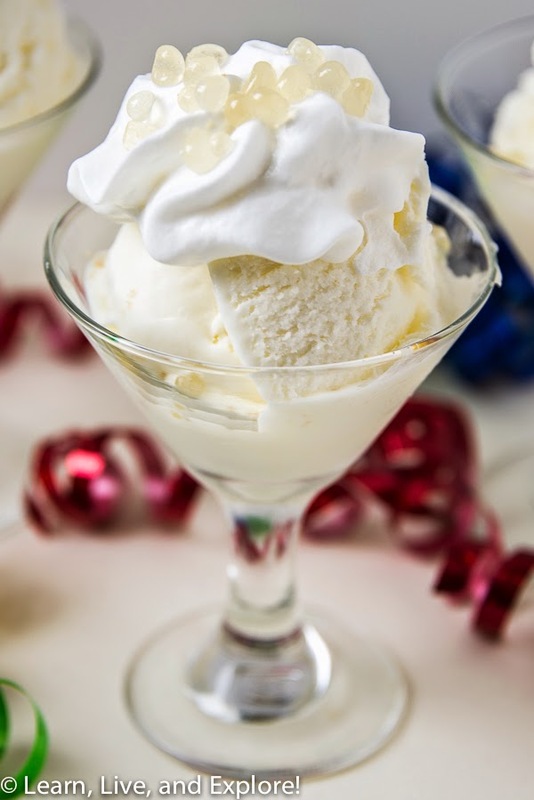 This ice cream does not need ripening (softening before serving), as it will not freeze too hard. 3 fluid oz. hot liquid (1/4 cup plus 3 tbsp) i.e. hot coffee, or other liquid heated on the stove-top or in microwave. For this margarita caviar, I used limeade concentrate (from a frozen can) and heated it up. Before you go through the instruction list, I suggest you check out the video on Sprinklebakes' website to get a better idea of the process. Place oil in a 9x13-inch metal pan (or similar size) and store in refrigerator overnight. The oil must be very cold for the gelatin to set properly. In a medium bowl mix the gelatin and water until thoroughly combined and no lumps of gelatin remain. Let stand while you prepare the hot liquid. Warm 3 oz. liquid on the stove-top or in a microwave until very hot but not boiling. Pour liquid over set gelatin mixture and stir until gelatin is melted. This may take a few minutes and you can break up the gelatin with a spoon for quicker dissolve. When gelatin is completely melted transfer liquid to a squeeze bottle. You can also leave the mixture in the bowl and use a medicine dropper or syringe to draw the liquid for dropping. Let the mixture stand for a few minutes, if it's too hot the gelatin will not set properly and the "caviar" will be misshapen. It should be just barely warm - almost room temperature. While you wait for your mixture to cool, prepare the oil for the ice bath. Transfer chilled oil to a 1 quart container (preferably metal because it will aid cooling, but glass will work too). Prepare the ice bath. Make sure the bowl you are using for the ice bath is larger than the container holding the oil. Fill bowl with ice and then add water until the bowl is two-thirds filled. Add 1/4 cup salt and stir until mixed. Rest the container of oil inside the water bath. Begin dropping gelatin mixture into the cold oil, 1-3 drips at a time. The amount of drips will vary according to the viscosity of the oil and type of dropper you use. As you can see in the video it took three drops for one caviar pearl to form. You'll know the correct amount when the mixture forms a ball that rests on the surface for a moment then sinks to the bottom. When half the mixture has been used, wait for 3-5 minutes then scoop the caviar into a mesh sieve to drain. Place caviar in an air-tight container or a canning jar with a screw-tight lid. Resume dropping the gelatin mixture into the cold oil until all of the mixture is used. When finished, place caviar in a canning jar or in an air-tight container with a little of the oil poured over top. It keeps the caviar moist for up to a week. Plus, if you don't like the idea of oil being on the caviar you can rinse it in a sieve under cold water before placing on the dessert. When stored with a little oil poured over and placed in an air-tight container the caviar will keep for up to 10 days.